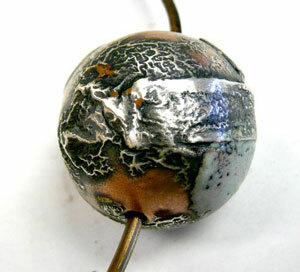 The bead is a 3/4" copper bead from Thompson Enamel (.95 cents). I melted short strips of fine silver bezel wire 3/4" high on the bead and then fused on enamel in 2 small areas in 2 separate firings. 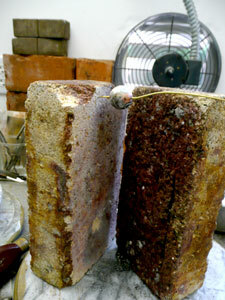 One of the enamel areas was wet packed on and one was sifted on as I wanted to try both. 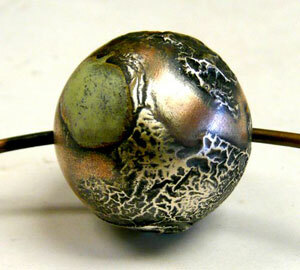 The bead was livered a bit last and enamel stoned down. The torch set up.... A wire was stuck in one side of the upright bricks and the bead was threaded onto the wire........ The more correct method would be to put the bead on a stainless steel rod.